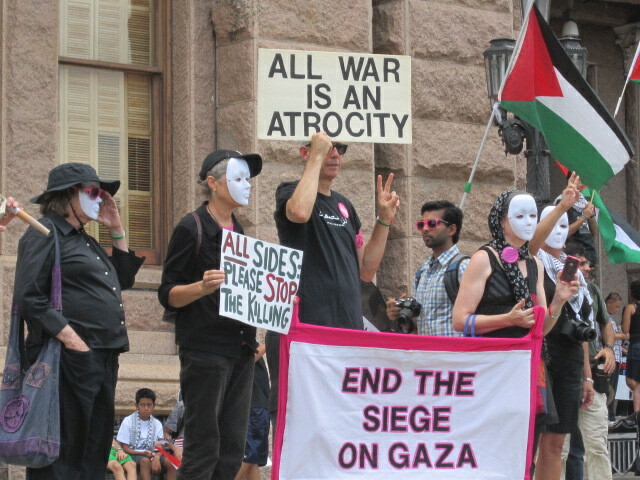 If you’ve read my recent post regarding the problems we ran across with the Palestine Solidarity Committee in Houston and Austin, Texas, you may believe Gilad Atzmon is an extremist and PSC has every right and reason to, “disavow Atzmon.” But, is any of what PSC says against Atzmon valid? Does Gilad hold extremist (and, as they say, racist) views? In fact, does it make any sense that those who claim solidarity with the people of Palestine, would go up against Atzmon? Forget that nobody I’ve heard from, or read words by, has bothered to read anything Atzmon has written. Ignore the fact that their words against GA are based in absolute conjecture and rumor. In fact, let’s forget about their fight against Gilad and, instead, look into their purported struggle against Israel. How does one fight/struggle against the Jewish state and balk at discussing Jews? Changing the word, Jew, to, Zionist, doesn’t fool anyone except for PSC-members. PSC should not be so dishonest as to use the words interchangably. Besides, doing this can too easily be explained away, as does the PSC, that half of all Jews are not Zionists. Again, I say, really? You see, I used to believe that tired line: “Every Zionist may be a Jew, but not every Jew is a Zionist.” I used to spout this line, myself! As I have grown to understand a lot more about Zionism and Jewishness and particularly about the Jewish state, I can finally state, if one stands with the state of Israel, or refuses to stand against Israel, he or she is a Zionist. Refusing to speak the truth of the Jewish-state of Israel should give everyone a clue; said person is a Zionist, or would at least be a zionist-sympathizer! The only Jews I can view as anti-zionists are those who refuse, on moral grounds, to live in Israel while calling for the complete destruction of Israel in favor of the rebuilding of Palestine. Anything less and said Jews and PSC-membership are Zionists. Perhaps this is a more comfortable position taken by the newly un-brainwashed, but it is a dishonest stance. Why would I call the newly changed PSC, Zionist or, at least, pro-Israeli? Well, just look at who’s front-and-center in their groups. Are these groups run by Palestinians? Yes, in part. However, their chairs are not open only to Palestinians. No; they are now filled by Western Jews. Is this not a bit suspicious? Like America’s Congressmen, who are ever and always on the side of Israel, is the questionable allegiance of the PSC Jews not to be questioned? 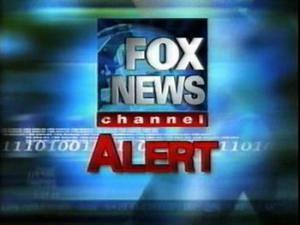 Would the group, Jewish Voice for Peace, select non-Jews to run their show? I think not. Yet Palestine Solidarity groups are led and co-sponsored by Jews. Does this make any sense? I did think this was a problem specific to Texas. I thought only Texas’ PSC was confused. However, as Gilad Atzmon tours America and finds the only black-listing he encounters comes from the PSC, I am seeing that the PSC has been infiltrated and changed by the Jews. And, yes, it makes me sad. For I thought we had a good thing going. I thought the PSC would possibly have a chance to help Palestine. Heck, I thought they wanted to help Palestine! I thought I could join with them and we could finally do something positive. Now, when I consider who’s running the show, I see this will never happen, at least not from this group. And this would mean it is time for a new group or, minimally, a new leader, to take hold and actually get back to the original intention set out for PSC. Perhaps you think Gilad Atzmon is this leader? I’ll ask, but don’t think he wants the job. One thing I absolutely know is this: Ali Abuminah is not the correct person for this important endeavor. Abuminah has allowed the new PSC members and chairs to re-mould him into a puppet for the Jewish-state of Israel. This is certainly not what Palestine needs! Palestinians already have this man in Palestinian-Authority’s Mahmoud Abbas, the jailer of Gaza. The Palestine Diaspora does not need a new Abbas. For, as Israel enjoys the unelected Abbas at the helm of Palestine politics, the Jewish state does also enjoy having Abuminah at the head of PSC. Why? Neither gets anything positive accomplished for any part of Palestine. How does anyone not see this for the problem it is? Disavow with no mercy? Not in my name! Finally, it appears that years of work, persuasion, temptation, pressure and coercion have yielded its fruits, with the publishing (made it into hyper Zionist hate-site Harry’s Place) of the joined statement by Mr Ali Abunimah and a few others, in which they brazenly called upon Palestinians and their supporters to disavow Gilad Atzmon because of his alleged “anti-semitism”. Here, I cannot help but wonder, what does Ali Abunimah mean exactly when he invites people to disavow Atzmon? Can this “disavowal” be understood as a modern secular-leftist substituted for the “good old” Judaic concept of Herem? Are we not entitled to ask then, if that concept of “disavowal” is by any chance related to the Talmudic concept of excommunication, in which “the Talmud forbids coming within six feet of a person who has been excommunicated“? 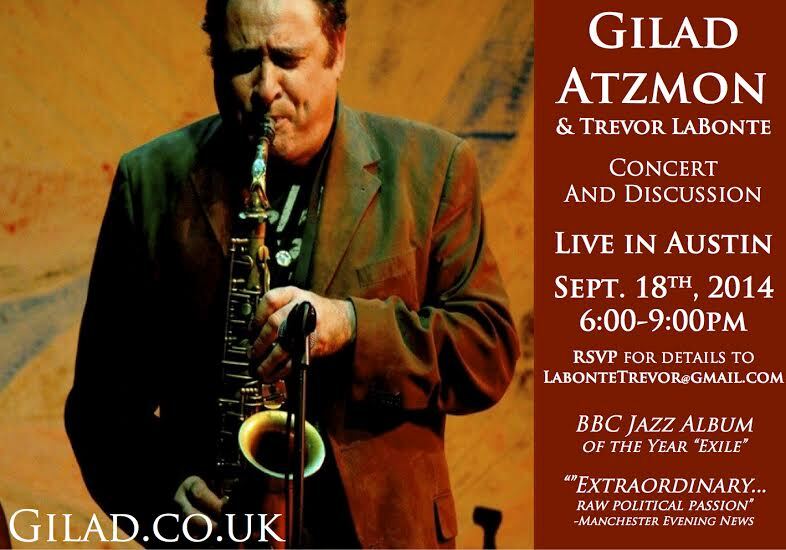 GILAD ATZMON, LIVE IN AUSTIN, 18 SEPTEMBER (THURS)!! Former Israeli, former IDF, former Jew, Gilad Atzmon starts his USA tour this week, in Houston and then comes to Austin!! Because we’ve had problems (in Austin, of all places?) with the self-appointed Central Texas arm of the ADL (and the freak, Craig Berlin, says, JDL) who’s attempted to close-down one of Gilad’s shows, we are providing information about LOCATION on an individual basis. I know it seems a bit nutty, but the Austin, “music scene”, is run by some unattractive characters who happen to also run the bipartisan-mafia, in Austin, and all over the USA. As talented a musician as Trevor Labonte is, he’s essentially lost his ability to earn a living via his chosen profession, in Austin. Who’s created his problem for Trevor? It is the same (usual; Berlin, aka, Protape) despicable excuse for a human as that’s harassed Gilad, as well as me, and anyone who points out the truth of Israel and Palestine and, “free speech”, in the USA! I think it is extremely important that we, minimally, fight back by going to hear musicians and speakers we care about. Do not allow these Israel-firsters and dual-citizens (anywhere in the USA) to tell us who can or cannot play music or make speeches, here! We must also take a long look at the farce of our Palestine -Solidarity Committee, who seem to only do what the israel-first group allows. Gilad Atzmon has been disavowed by the Palestine Rights movement for his racism and anti-semitism. I’ve attached a copy of Ali Abunimah’s article on him. What group are you with that invited him? Who is “we”? Now, Gilad Atzmon is far from being a hater, of anyone, but the ICPR doesn’t seem to comprehend that they are using the exact same ploys AND words as the ADL! What good is this group to the people of Palestine? I find them imposssible and worse than our irritating ADL manipulators. Someone needs to speak to them, and if they had open minds, I know Gilad Atzmon could explain the problems of allowing the wrong people to lead the group. And I hope to see MANY of you, in Austin, Thursday night! Another family suffering the tortures of the Damned at the hands of the Israeli Government.